New Japan starts building towards Wrestle Kingdom 13 – AiPT! 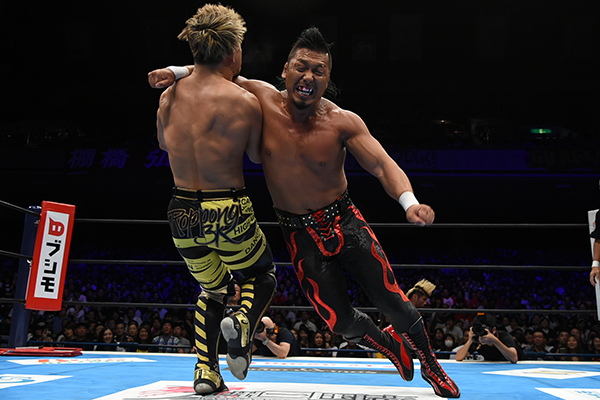 This past Monday, New Japan Pro Wrestling held their annual King of Pro Wrestling event. The show furthered a lot of storylines and the next few months will be a very interesting period for New Japan in the buildup to Wrestle Kingdom 13. So let’s see what happened and where things go from here. Both Kenny Omega and Hiroshi Tanahashi had everything to lose at KOPW. Tanahashi’s Wrestle Kingdom title shot was on the line against Jay White, with Tanahashi overcoming all the tricks that White could think of to win the match. Omega had to see off both Kota Ibushi and Cody in order to retain the IWGP Heavyweight title. After the show it was confirmed that the Wrestle Kingdom 13 main event will be Omega vs Tanahashi, with Omega wanting to prove that he is the top guy in New Japan by defeating the man who carried New Japan for years. Bullet Club OG went into KOPW as an afterthought and came out as a big focus for New Japan. First, Taiji Ishimori announced that he had chosen Australian Robbie Eagles as his partner for the Junior Tag League. The big news was when the BCOG came out after Jay White vs Tanahashi. This led to Jay White, Gedo and Jado joining the BCOG. This made BCOG seem like New Japan’s biggest heel group. The only downside is that it looks like CHAOS won’t have the reshuffle that a lot of long term fans, myself included, were hoping for. CHAOS has had a bad 2018. The group lost all their titles, Switchblade created tension before leaving and Okada has lost his way. The glimmer of hope for the group came in an unexpected form. During a CHAOS vs Suzuki-gun 6 man tag, Will Ospreay pinned the NEVER Openweight, Champion Taichi. The CHAOS team made the win feel like a massive deal and Ospreay wants to win the title and truly make it an open-weight title, with the match made for Power Struggle in November. While I fear that Taichi might win that match, I hope that Ospreay becomes the Champion as making that belt a true open-weight title will help to freshen things up. I also see a possible Ospreay NEVER run as a precursor to him joining the Heavyweight division or even entering the G1-Climax. One of the matches that I was looking forwards to was EVIL vs. Zack Sabre Jr. So of course Chris Jericho had to go and ruin it by jumping EVIL before the match. Jericho has been one of the weirdest parts of New Japan this year, as we haven’t seen him since he won the IWGP Intercontinental Title. I like that this set up Jericho vs EVIL at Power Struggle, which seems like a good opportunity for EVIL. At the same time, the match does feel like it’s a place holder to build up a Jericho vs. Naito rematch at Wrestle Kingdom. After the beat down, Sabre was incensed at a wasted 12 hour flight and took his frustrations out on EVIL. Naito came out to help his Pareja, setting up a Power Struggle match vs. Sabre which could easily be the best match on that show. Speaking of Parejas, the big question going into KOPW was “who will be the sixth member of Los Ingobernables de Japon?” Well, despite Naito teasing that it was color commentator Milano Collection AT, the answer was Shingo Takagi. Shingo is a former champion in Dragon Gate, a brawling power wrestler who dominated with strength in a roster full of Junior heavyweights. He made an impact in his debut match and he will be starting out by teaming with BUSHI in the Junior Tag League. Although, I can’t imagine Shingo staying in the Junior division for long — I mean, Takagi and Ospreay in next years G1-Climax is a tantalizing possibility, even though it would be very unlikely. Following Hiromu Takahashi’s injury, a four man tournament was held to crown a new Jr Heavyweight Champion. KUSHIDA managed to beat Marty Scurll in a great match to become a six time IWGP Jr Heavyweight Champion. Only Jushin Thunder Liger has held the title more times. Speaking of Liger, he and Tiger Mask lost their Jr Tag Title match due to the underhanded tactics of Yoshinobu Kanemaru and El Desperado. The tour leading up to Power Struggle is dominated by the Junior Tag League. In addition to Liger & Tiger Mask, Kanemaru & Desperado, BUSHI & Takagi and Ishimori & Eagles, four other teams compete. Those teams are Roppongi 3K (Sho & Yoh), KUSHIDA & Chris Sabin, Ryusuke Taguchi & ACH and CMLL duo Volador Jr & Soberano Jr. The final will be held at Power Struggle. It will be interesting to see how the road to Wrestle Kingdom 13 develops. We will have an update for you in a month or two to discuss the build up and matches for Wrestle Kingdom.